Tudor Fireplace Mantel carved from real solid stone like it was hundreds of years ago. The Tudor Style surround dates back hundreds of years and is still in style. 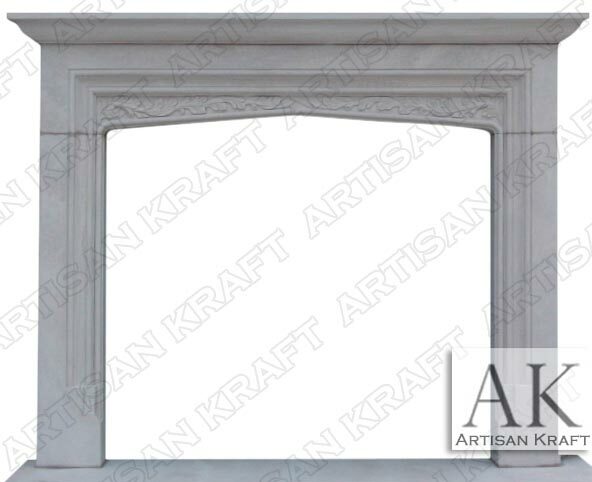 This traditional English surround can be carved from limestone or marble. Sandstone is also a great material choice due to its appearance. We also offer this facing made from cast stone. This surround is adorned with details like the leaves in the facia that peaks in the center. There are also lots of steps in the jambs of the surrounds and the pedestal. The Sandstone Tudor Fireplace is a staple of Tudor era architecture. Picture in White Sandstone. Also available in Beige Sandstone.